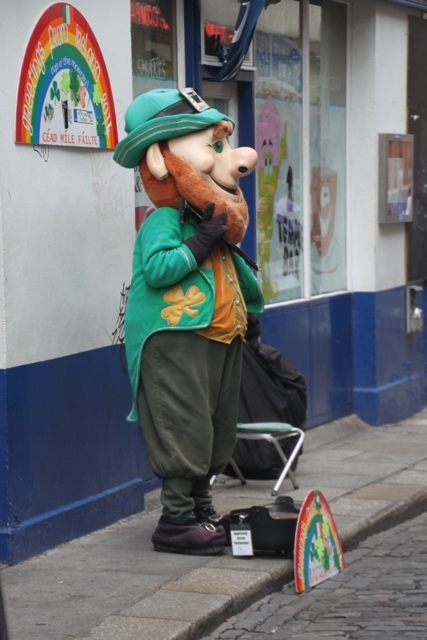 Leprechauns all done – or so we thought until we bumped into this chap, we spent the rest of our afternoon strolling around Dublin taking in the sights and sounds of this lively and historic city. Most of the main sights are situated in a comparatively small area so walking is a breeze. We headed first to the River Liffey, sat for a while on the river bank eating sandwiches then used the Ha’penny Bridge to cross to the other side. My favourite Dublin bridge, not too tricky to see why this is the most photographed river crossing in the city. In the days before the bridge people crossed the river using a ferry. These were in bad condition and the owner was given an ultimatum – either fix the boats or build a bridge. He went for the latter option and charged anyone crossing a ha’penny toll. The name stuck but it’s free today. 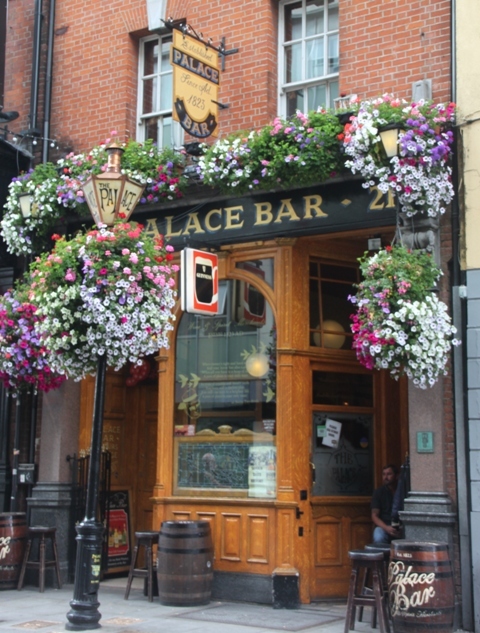 Just across the road and down a side street we found ourselves in Temple Bar – the hub of Dublin nightlife. We’ve been in this area before, always early when it has been deserted and we always wondered what all the fuss was about. Today we strolled through late afternoon and totally got it. Narrow cobbled streets lined with traditional pubs which were buzzing. Lots of bands, live music playing everywhere and a great atmosphere. It felt very family friendly – not too sure about later in the evening though. I sought out Fishamble Street – where Handel’s Messiah was first performed in April 1742. A big fan am I, this was my must see. We carried on past the Central Bank and saw the building that is now the Bank of Ireland but once was Ireland’s Parliament Building. Son was disappointed Molly Malone (“the tart with the cart” as she is also fondly known) his favourite Dublin statue was nowhere to be seen – apparently away for renovation and repair work she will be back. 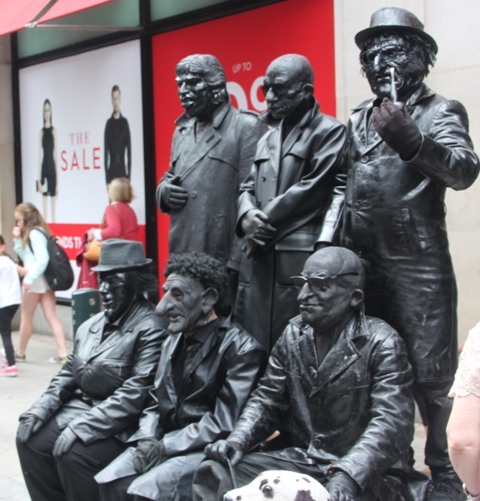 Grafton Street – a pedestrian area and Dublin’s main posh shopping zone was also buzzing with life. 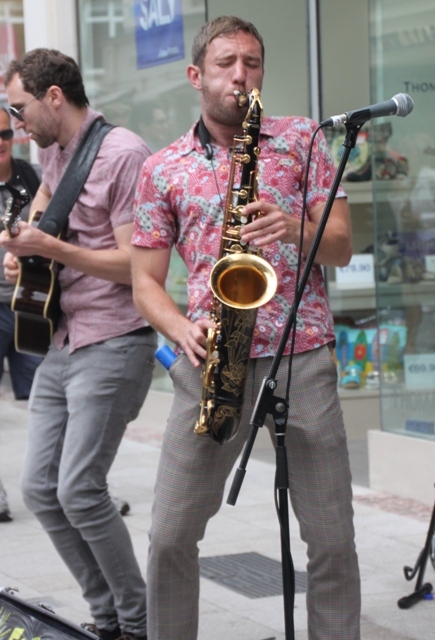 We peeked in the windows of the grand department store Brown Thomas but for us it was all about the buskers – a whole street full of them. A hour flew past as we watched amongst others mime acts, musicians, a quirky and very lithe elderly gent and then our son transformed into a wee green man. At the end of Grafton Street and across a busy road is Fusilier’s Arch and the entrance to St Stephen’s Green – just what we needed after all the hustle and bustle – a calm, green oasis right in the heart of the city. Son fed the ducks and found a great playground where he leaped, climbed and generally let off steam while we lounged on the grass. All too soon it was time to leave. We retraced our steps through the city, this time using O’Connell Bridge to cross the river. Apparently this is the only bridge in the world that is wider than it is long. We had planned to linger a while on O’Connell Street but a sudden burst of torrential rain put paid to that idea and a dash back to our car became a priority. A rather hasty goodbye to the wonderful city of Dublin – hopefully see you next summer! Dublin is so beautiful. Where there 2 years ago. What a beautiful reminder, Joy! Thank you! We love it there Erika – lots to see but a great atmosphere too! It’s a lovely city – lots of lovely places to see, full of culture and a buzzing atmosphere, we had a great time there,. We leave on Saturday. What a wonderful start to our return to Dublin reading your post. The photos are lovely. Do you know, are we likely to see flowers at this time of year there? Daffodils are everywhere here at the moment – you should see lots of those over there and some other spring bulbs for sure – a good time to visit I think! Have a safe journey – looking forward to reading all about it!! I remember those days when afternoons in the pub were a common feature on our sightseeing agenda!! No more though….. It is great for children, lots to see and plenty to do, everyone is very tolerant of kids as well so you just soak up that relaxed vibe. Hope you get the chance to explore with your little monkey sometime. It looks like a great city, Joy. Is there a perpetual party atmosphere or only during certain parts of the day and in specific parts of the city? Some parts are pretty serious George but other areas do have the party vibe – Temple Bar being the most popular one. We found it incredibly lively in the afternoon and I think the party goes on there until the very early hours – too late for us party poopers though!! Fab! I love Dublin. The first time, we made the mistake of staying in Temple Bar. I can report that it is quite noisy at night! I can imagine you got very little sleep on that trip Anabel – considering the noise level and party atmosphere there at 2pm when we strolled through!! We love it there too though and were pleased to experience the music and life in this area on our trip this time. Sounds like a great way to spend a weekend Andrew for sure!! So glad you enjoyed Belfast Suzanne – I studied there and love to go back as much as I can. We love Dublin too – try and visit once a year if we can. Actually, we prefer Belfast to Dublin. Less tourists and so much to see though we truly didn’t plan sufficient time in Belfast. We could have easily stayed a few more days. Truly a place to visit. Your post reinforces my wish to visit Dublin someday. Great pictures and descriptions! Thank you – it’s a great fun and lively city, lots of culture and history too and definitely something for everyone. We love it and would highly recommend! Oh get Messiah out for sure and play it before Easter ends!! you’re not missing out on much – temple bar at nighttime is insane and kind of rowdy. i almost got pick-pocketed there! The atmosphere was really good in the early afternoon – I could well imagine things getting a bit less desirable though in the evening and at night. Seems like this was probably the best time to go? A fun reminder of a bit of time I spent there almost 10 years ago. It’s a fun city – sounds like you enjoyed it there! We had a great time on our short trip. It’s a wonderful city – we love it and would definitely recommend!! Put it on your must-see travel list Benjii!! 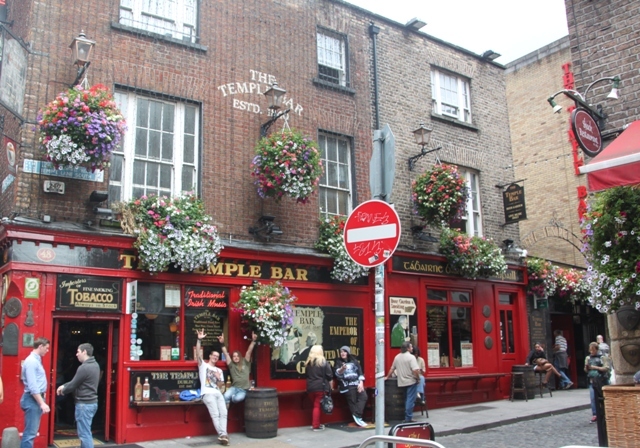 We were in Dublin, and Temple Bar, for an American college football game last fall–it was such fun. A great city, any way you visit it! There must have been a great atmosphere for the football game! Totally agree, it is definitely a great city. Love the narrow streets and all the cozy pubs! Temple Bar looks like a fun place for a pint! How do you find understanding the Irish dialect? It was a lot of fun even in the early afternoon and I loved this whole area with its cobbles and quaintness. I actually come from Ireland so the accent is fine for me – not so easy for my husband and son all the time though!! Love your pictures. Haven’t made it over to Dublin yet but looks like a really interesting place with so many things to do! Thank you Victoria! It is a beautiful city, we try and visit every summer and always find something new and different so always have a new experience there. We love it! Sounds like a great visit, it’s so nice to walk along the river there! I can say from experience that at night the temple bar is not always family friendly haha. But it is fun! I can imagine how things might not be so suitable for the kiddies there as the evening progresses but can imagine the fun too!! Looks so fun! Planning a possible trip there this summer!!! We really enjoyed our (brief) time there Diana – it’s a great city, loads to see and do and like you say, a lot of fun! Fun pictures! Now, I need to add Dublin to my list! Thanks Laura – it’s a great city, definitely deserving a spot on your list!! 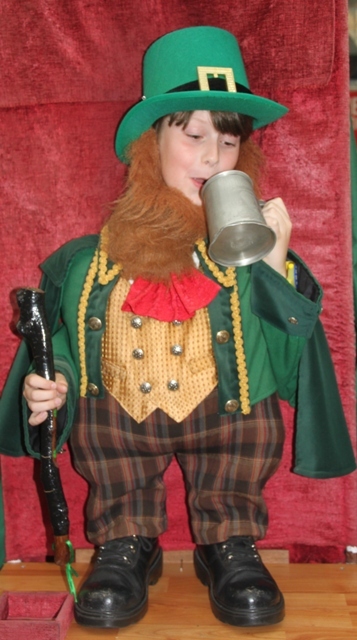 Love the photo of Son as a leprechaun. Thanks for the chuckle:) All the best! Thanks Melissa – he definitely enjoyed bringing out the leprechaun side of his personality for sure!! Hmm Dublin ! Have you ever been to the Guinness brewery ? Yes but so many years ago I hardly remember anything about it – before our Son was born so I’m sure it’s changed a bit since then. Have you been there? Good to know – we visit Dublin most years and I think it will now go on the list again!! Great pint in the Palace Bar! My parents are on their way to Dublin in a month. I am definitely going to share this post with them. So informative and helpful! Thanks Joy! Thanks Jenny – hope they have a great time in Dublin, I’m sure they will!! Thank you – it’s a great and gorgeous city! I know the feeling with hotel WiFi Rosemary – I’ve been really haphazard too with blog reading over the Easter holidays! Glad you’re enjoying the warmer weather – I know what you mean though about people in summer clothes, I follow my granny’s view and don’t cast a clout till May is out!! There is definitely a chill still in the air but so lovely to see the sunshine we seem to have been deprived of for so long. A bit of a mixed weekend supposedly but the weather is rumoured to pick up again next week – fingers crossed. Hope your weekend is great too! Dublin is so awesome ay! I loved the atmosphere in the pubs. Everyone dancing with each other, singing and generally happy at life! We loved the atmosphere too – great fun for sure! 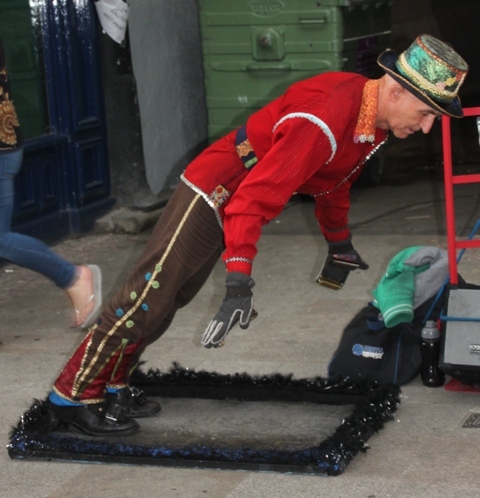 Been in Dublin and it’s a very nice city…. Definitely – fun with a great atmosphere and loads to do as well. It’s a great city – buzzing atmosphere, fascinating history and so much to do. If you ever go back to Ireland you should definitely try and visit! Dublin is a great city – somewhere I could never tire of! I have stayed in Dublin for 7 months before (a long time ago) and I am familiar with all the photos you posted. Your post reminds me of my good memories in Dublin. Thank you! It is a wonderful city – a great place to stay for a few months I would have thought!! Thank you for coming by and commenting. It is a gorgeous city – we loved visiting! Thanks for reading and commenting. 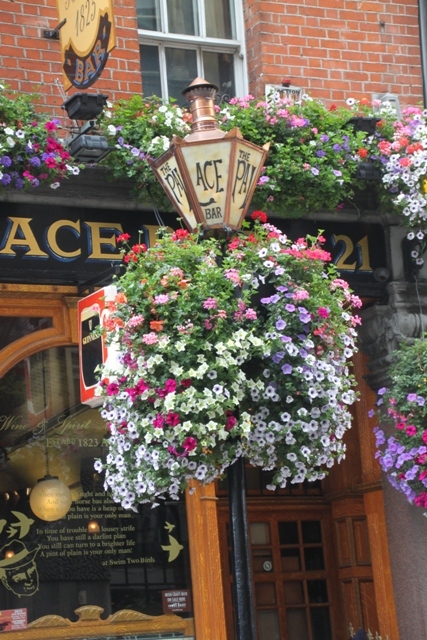 Beautiful photos of The Temple Bar. I’m going to Ireland this summer and Dublin is probably the place I am most excited to visit! Dublin is a great city – buzzing and full of life, I love it there. 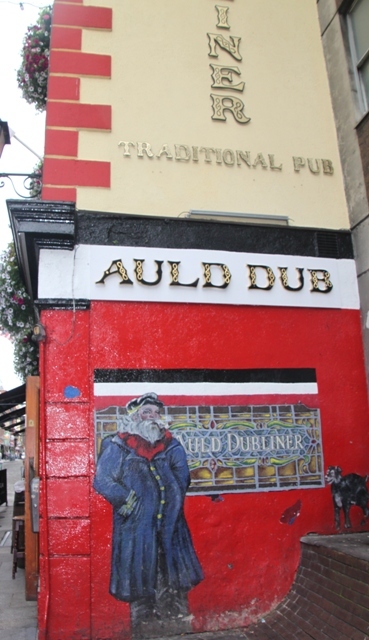 We go to Ireland every summer to visit family – Dublin is always on our agenda!! Wonderful. So nice to read, so much rememeberance before my very eyes again 🙂 . I stayed in Dublin in August 2017. Get a look at my pictures, so you wish. Already getting “homesick” to Ireland. Dublin is a great city for sure!